Conservative critics of Obama argue his policies will inevitably lead to high inflation. A previous blog post on this site showed that in fact inflation during the four years of Obama’s first term had been the lowest over any presidential four year term going back a half century. Low inflation during Obama’s first term cannot be denied. The conservative critics respond that while inflation may have been low so far, it is inevitable that inflation will soon rise. The blog post cited above provides links to several examples of what they have been saying. But this assertion can be examined as well. In particular, the financial markets (which the conservative critics generally take as reflecting a sound view on such matters, as the investment returns of such investors will depend on getting this right) can be used to see what at least the markets believe inflation will be going forward. Since 1997 the US Treasury has been issuing bonds of varying maturities whose principal is indexed to the US CPI price index. These bonds, known as TIPS (for Treasury Inflation-Protected Securities), provide a return which will be the same in real terms regardless of what inflation turns out to be. The yields on such bonds can be compared to the yields on regular US Treasury bonds of similar maturity. Such regular US Treasury bonds will pay interest and at the end return the principal in certain dollar amounts, with a value in real terms which will vary depending on what inflation turned out to be. Inflation is normally positive, so the regular bonds will pay rates which are higher than the rates on TIPS bonds. But whether the higher rates are worthwhile will depend on how high inflation turns out to be. To illustrate with some simple numbers, suppose the rate on a 10-year regular US Treasury bond is 3% while the rate on a 10-year TIPS is 1%. If inflation turns out to be 2%, the bonds will be equally valuable. But if inflation turns out to be 3%, it would have been better to have invested in the TIPS. The TIPS will still pay out a 1% real return, while the regular US Treasury will yield a real return of only 0% (a 3% nominal return, but with 3% inflation the real yield will be zero). Alternatively, suppose inflation turns out to be 1%. The real return on the regular US Treasury will be 2% (equal to 3% minus 1%), while the TIPS will still yield the contracted 1% real return. In one believes inflation will be just 1% over this period until maturity, it would have been better to have invested in the regular bonds. The investors will therefore need to determine what they expect inflation to be. They will bid up the price of one of the bonds (and bid down the price of the other) if they believe inflation over the time to maturity of the bond, will be higher or lower than the current gap in the yields between the two. Where the prices of the two bonds settle, and therefore what the gap in yields is between the two, therefore reflects what the financial markets as a whole believe will be the rate of CPI inflation over the period until the bonds mature. Since real money is riding on this, the investors will take it seriously. The graph above shows the yields on regular 10-year US Treasury bonds (in blue) and on 10-year TIPS (in green), for the period from January 2, 2003, to August 8, 2013. The data comes from the official US Treasury web site (where the data presented there goes back to January 2, 2003). The implied 10-year expected rate of inflation (in red) is then calculated based on the difference between the two yields. As can be seen in the graph, the yields on the regular 10-year US Treasury bond varied a fair amount over the period, from generally between 4 and 5% during the Bush presidency, falling over time to below 2% for much of 2012, and then rising to about 2 1/2% recently. The 10-year TIPS yield similarly varied from around 2% during the Bush years, to negative levels for 2012 and the first half of 2013, and rising to a still low but positive 1/2% recently (and most recently just 1/3%). 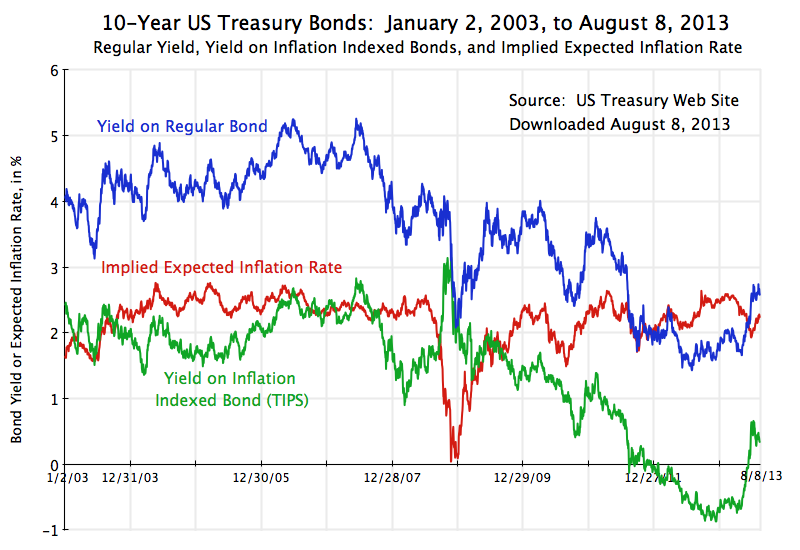 Despite such fluctuations in the yields of the regular 10-year bond and the 10-year TIPS, the implied expected inflation rate (the difference between the two yields) has been relatively constant, at about 2 1/2% during the Bush years and a similar but slightly lower rate (on average) during the Obama presidency. The one exceptional period, which should be excluded, would be during the period of economic and financial collapse in the final months of the Bush presidency, after Lehman Brothers went bankrupt and the financial markets were in chaos. The TIPS yields went up while the regular US Treasury bond yields fell sharply, leading to an implied expectation of inflation of close to zero. But the figures under such chaotic conditions should not be taken as meaningful. The chaotic markets then stabilized within a short period of Obama taking office in January 2009, with the rates then returning to more normal levels. The financial markets, which the conservative critics of Obama normally place a good deal of faith in, therefore do not show any indication that they expect inflation over the next decade to rise. Rather, they expect inflation of around 2% a year to continue, which is consistent also with the rate of inflation the Fed targets. Finally, the figures on the bond yields in the graph above also show that the US government has been able to borrow, and continues to be able to borrow, at incredibly low rates, whether in real or nominal terms. The TIPS yield (the borrowing rate in real terms) was indeed negative in for most of 2012 and the first half of 2013, and is still only 1/2% or less. Even were it not for the still high unemployment in the country, this is the period when the government should be undertaking investments in both new infrastructure and other assets, and in maintenance of existing assets. Such investments are worthwhile even if they generate returns of only 1/2% in real terms. Yet such investments, particularly in maintenance, will generate returns that are orders of magnitude greater than that. It has been incredibly stupid that the Republican insistence on cutting government spending has blocked us from proceeding with such investments at a time when the borrowing costs to fund them have been so low. One of the most persistent criticisms of Obama and the economic policies followed during his term as president is that they would inevitably lead to high inflation, or indeed hyperinflation according to some. The argument was that high deficits, driven by high government spending (even though government spending has in fact been coming down, see my previous blog postings here and here), plus the aggressive actions taken by the Fed to help the economy recover from the 2008 collapse, were boosting government debt and the money supply, and this would inevitably lead to soaring inflation. The arguments have been made not only by conservative politicians and political pundits (see here and here for examples), but also by conservative economists such as John Taylor and Michael Boskin, both full professors at Stanford, who served in high positions in the administrations of Bush, Jr. and Bush, Sr. (respectively), and who also both served as senior advisors to Mitt Romney during his recent presidential campaign. For examples of some of their non-academic writings on the issue (some co-authored with Congressman Paul Ryan), see here, here, here, and here. John Taylor has indeed like to joke that the US is heading down the hyperinflationary path of Zimbabwe, and carries around a hundred trillion Zimbabwe dollar note in his wallet (as does Paul Ryan) to show people what may soon happen to the US. And the forecasts that Obama’s policies will lead to soaring inflation continue. The forecasts were that soaring inflation would soon be upon us. But nothing could be further from the truth. We now have data for the full four years of Obama’s first term, and can compare inflation during this period to that of other presidents. The graph above shows that average inflation over the four years of Obama’s presidency was the lowest of any presidential term going back a half century to the 1961-64 term of Kennedy/Johnson. 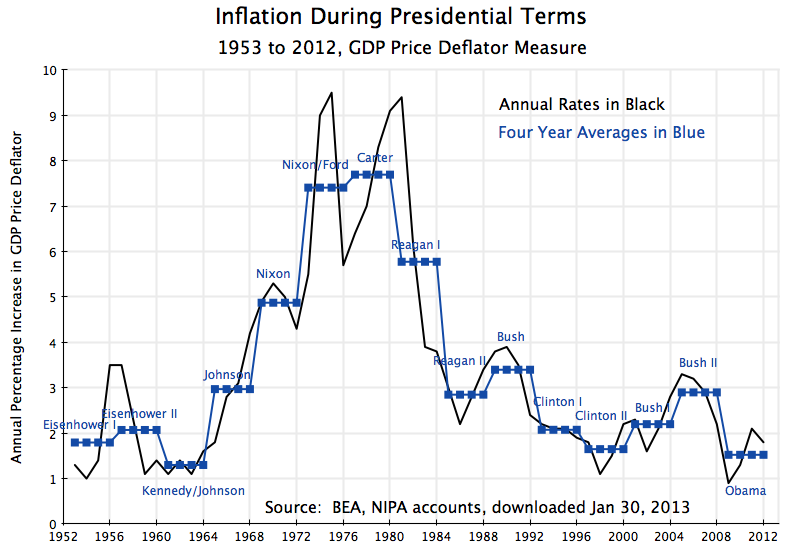 It was substantially lower than inflation during Bush’s two terms, was also somewhat below inflation during Clinton’s two terms (when inflation was less than during Bush), and so on back to Kennedy/Johnson. The inflation measure graphed above is the GDP price deflator. This is the most broad-based measure of inflation for the economy as all goods or services produced or used in the economy are covered, weighted by the value of what was used. One could alternatively have used the price deflator from the GDP accounts for just the personal consumption component of GDP, but the results would have been the same: inflation by this measure was less under Obama than under any presidency going back to Kennedy/Johnson. And similarly, one could also have used the consumer price index, the common measure of inflation of goods and services used by households, and again have found the same results. Inflation during Obama’s first term averaged 1.5% a year (as measured by the price deflator for GDP, and also 1.5% a year as measured by the deflator for the personal consumption component of GDP). Will it stay so low? Hopefully not. The Fed indeed now targets inflation to be about 2% a year, so average inflation during Obama’s first term has been below that target (although close to it in 2011 and 2012: see the graph above). With the economy still weak, some analysts have indeed argued that moderately higher inflation of perhaps 4 or 5% a year would help the economy to recover more quickly. Prominent proponents of such a higher target include Professor Paul Krugman (see here and here) and Olivier Blanchard, the chief economist of the IMF (see here). Inflation can thus be expected to rise above what it has been, and indeed there would be benefits were it to rise to a still modest level such as 4 or 5% for a period. But inflation over Obama’s presidency up to now has been exceptionally low, and the forecasts by the conservative politicians, pundits, and even some economists that Obama’s policies would quickly lead to soaring inflation could not have been more wrong. The Bureau of Economic Analysis of the US Department of Commerce released this morning its first estimate of GDP growth in the fourth quarter of 2011. The headline figure of 2.8% growth of total GDP might look reasonably good (actually, it is less than is needed in the on-going recovery, with unemployment still so high; it would be a reasonable growth rate if the US were already at full employment). But the underlying details that led to this overall growth are worrisome. As has been noted before in this blog, the short run dynamics of the quarter to quarter change in GDP is heavily influenced by what is happening to the change in private inventories. Keep in mind that it is the change in the change in private inventories that is one component of the change in GDP in any given quarter. In the third (and final) revision to the estimated GDP accounts for the third quarter of 2011, the change in private inventories was essentially zero. This was down from a positive growth in inventories in the second quarter, and hence the contribution to the change in GDP in the third quarter was negative. I noted then that there was a good chance that inventories would return to some positive growth in the fourth quarter, and hence spur the GDP growth figure for the quarter. And this they did. According to this first estimate for the fourth quarter, 1.94 percentage points of the 2.76% growth in total GDP (rounded to 2.8% in the reports), was due to this bounce back of private inventories. That is, 70% of the growth (1.94 / 2.76) was due to the change in the change in private inventories. Leaving out this change in the change of private inventories, the growth of final sales was just 0.8%. This is substantially down from the 3.2% figure for the third quarter. This is a disappointment. If final sales do not grow by more than that now, in the first quarter of 2012, one can easily see private inventories being cut back, and overall GDP growth would then be negative. If that happens for two quarters, one will have met the standard definition of a new recession. Not good in an election year (or any year for that matter). There were two main reasons why final sales grew so much more slowly in the fourth quarter of 2011 than in the third quarter. One was that non-residential fixed private investment grew by only 1.7% in the fourth quarter, sharply down from the 15.7% annualized growth in the third quarter. It was still positive growth, and hence contributed to overall GDP growth, but only by 0.18 percentage points vs. a contribution of 1.49 percentage points in the third quarter. Offsetting this a bit was the encouraging figure that residential fixed investment (mainly housing construction) grew at a 10.9% rate in the fourth quarter. This was the fastest growth for such investment in a year and a half. But this quarter to quarter figure can bounce around substantially. More importantly for the contribution to overall GDP growth, residential fixed investment has declined by so much (since 2006), that it is now a relatively small share of GDP. It would need to triple (i.e. grow by 200%) to get back to where it was before. And non-residential fixed investment is 4.6 times as large, so what is happening to non-residential fixed investment is much more important. But the most important reason for the disappointing growth in fourth quarter GDP was an absolute decline in government expenditure. Total government consumption and investment expenditure fell by 4.6% in the fourth quarter, with federal government expenditure falling by a sharp 7.3% and state and local government expenditure falling by 2.6%. For 2011 as a whole, federal expenditure fell by 2.0%, while state and local expenditure fell by 2.3%. With this drag caused by falling government expenditures, it should not be surprising that GDP growth was so weak, held up mainly by inventory accumulation. And if inventories now revert (over time, the quarter to quarter changes average close to zero), the US could fall back into a recession. Yet many Republicans and especially the Tea Party supporters continue to claim that the way to get strong growth is for government to contract. They claim that such contractionary policies will be expansionary. Yet one sees no evidence of this in the new figures. If it were not for the accumulation of private inventories (items produced but then not sold), GDP growth in the fourth quarter of 2011 would have been extremely weak. Contractionary policies are contractionary. But there was good news on the inflation front, assuming one believes lower inflation is always good. As part of the GDP accounts, the BEA also estimates the price deflators for the various GDP components (so as to go from the nominal measures to real ones, so one can then get real growth rates and changes), and in particular the price deflator for Personal Consumption Expenditures (PCE). This PCE deflator is favored by many, including reportedly Alan Greenspan (although he in fact focused more on the core PCE deflator, which excludes food and energy prices), as the best estimate of what is happening to US inflation. The PCE deflator rose by 1.8% in 2010 as a whole, and then at an (annualized) rate of 3.9% in the first quarter of 2011. Conservative economists, such as John Taylor of Stanford and Allan Meltzer of Carnegie Mellon, as well as Republican politicians such as Congressman Paul Ryan and others, had complained of the Fed’s aggressive policies to spur the economy, and asserted that they would lead to high inflation in the US (see, for example, here and here). John Taylor often invoked the hyperinflation in Zimbabwe as a warning of what could happen if monetary policy was not brought under control (see, for example, here). The rise in the PCE deflator in early 2011 was promoted as evidence of inflation starting to rise. Keynesian economists, such as Paul Krugman, argued inflation was not a concern, with the economy in a liquidity trap and high unemployment keeping down wages so that unit labor costs were falling or flat. They argued that the rise in observed inflation in early 2011 was due to changes in volatile commodity prices such as oil, and that such changes are rarely sustained. What has happened since early 2011 clearly supports Krugman and the Keynesians. After rising at a 3.9% rate in the first quarter of 2011, the PCE deflator rose at a 3.3% rate in the second quarter and a 2.3% rate in the third quarter. And the newly released figures for the fourth quarter indicate an estimate of just a 0.7% rise in the fourth quarter. While the fourth quarter figures are subject to change, the trend is clearly down, with an inflation rate that is indeed arguably now too low. Such a low inflation rate makes it more difficult for the economy to adjust (as relative prices are then more difficult to adjust), plus the very low rate increases the risk of the economy declining into price deflation, where it can be very difficult to emerge (as Japan faced in the 1990s). One final point: One should not put too much weight on any figures on the economy for just one quarter. Quarter to quarter figures can bounce around a lot. And the figures released today are simply the first estimates of what the economy was doing in the last quarter of 2011. Over the next two months, these initial estimates will be revised twice, as is always done. Sometimes the revisions can be significant. Still, some of the initial estimates are of concern, and should the trends continue into 2012, the economy will be in trouble.